tattoo stencil: The Great Thanksgiving Tattoo Event! 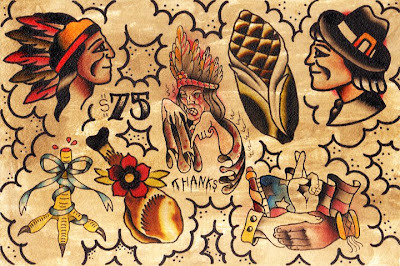 The Great Thanksgiving Tattoo Event! Loyal readers may remember this past August when I called on fans of Tattoosday to choose (and generously bankroll) Friday the 13th tattoos for Melanie and me. If not, relive it here. Well, a recent email from the good people at Skin Actives Scientific got me thinking. They asked if I wouldn't mind receiving some samples of their Troll Skin Aftercare products and talking about them here on Tattoosday. I thought, what better way to promote something but to actually use it? The problem was, I had no immediate plans on getting a new tattoo. But then it hit me, as the good people at Hand of Glory Tattoo, who inked our Friday the 13th tattoos, announced that, starting today, through the end of next week, they have another tattoo special, in honor of Thanksgiving! Now, dear readers, what tattoo should I get? Send your first, second and third choices to Tattoosday@gmail.com. Every email (one per person please) will enter a reader into a random drawing for Troll Skin samples. Plus you'll have the pleasure of knowing you had a hand in deciding how I will be permanently honoring this most thankful of holidays. You have until Wednesday at 9:00 AM (EST) to vote and when you wake up on Turkey Day, you can tune into Tattoosday to see which tattoo won and who will get Troll Skin samples! Then, in a couple of weeks, you'll hear back from me about how the tattoo healed and what I think about the product. And before some of you start scratching your heads about why I would indiscriminately get a tattoo just for the heck of it, I would remind you it is Thanksgiving, and what better to have on the human tapestry, than a reminder that we should always be thankful for the important things in life. I have a lot to be thankful for, above and beyond my awesome wife, Melanie, my kids, and my family and friends. I am thankful for you, the Tattoosday contributors, fans and readers, for inspiring me with your stories and supporting me with your comments and emails. And, of course, to the good folks at Skin Actives, for agreeing to support me in this Thanksgiving adventure, a special thanks this holiday season. Stay tuned and don't forget to vote!